Bitcoin price is slowly recovering, but facing many hurdles on the upside. Ethereum and ripple are climbing higher towards key resistance levels. MGO, IOST and NPXS gained more than 10% today. Bitcoin declined towards the USD 3,350 level recently, where buyers emerged. Later, BTC/USD started a short term upside correction and moved above the USD 3,385 and USD 3,400 levels. However, there are many hurdles for buyers near the USD 3,460 and USD 3,500 levels. Therefore, a short term rebound is likely to face resistance near USD 3,500, and later the price is likely to resume its decline. Similarly, ethereum is approaching (UTC 08:20 AM) the USD 106 and 108 resistance levels, which are likely to cap upsides in ETH/USD. Additionally, ripple price is likely to find a strong selling interest if it reaches USD 0.300. After forming a short term support near USD 3,350, bitcoin price started an upward move. BTC/USD traded above the USD 3,385 and USD 3,400 resistance levels to move into a short term positive zone. The price may continue to correct higher, but buyers will most likely struggle to break the USD 3,460 and USD 3,500 resistance levels. As long as the price is below the USD 3,460 and USD 3,500 levels, it remains in a downtrend. Once the current correction is complete, the price might drop back to USD 3,400, USD 3,350 or even USD 3,300. Ethereum price also recovered above the USD 102 and USD 104 levels. However, ETH/USD is struggling to break the USD 106 resistance level, above which the next barrier is near the USD 108 level. If the price continues to struggle near the USD 106 and USD 108 levels, it could decline once again. An immediate support is at USD 101, below which the price may accelerate losses towards USD 95. Bitcoin cash price found support near the USD 105 level and later corrected higher. However, BCH/USD is facing a lot resistance near the USD 110 and USD 112 levels. A break above USD 112 might push the price towards the USD 115 resistance. EOS recovered and moved above the USD 2.20 resistance. It is currently trading near USD 2.25, with an immediate resistance at USD 2.30. The key supports on the downside are USD 2.22 and USD 2.20. Ripple price started consolidating losses above the USD 0.280 level. On the upsides, there are many hurdles for buyers near the USD 0.292, USD 0.295 and USD 0.300 levels. On the downside, the key support is at USD 0.280, below which the price may drop to USD 0.265. 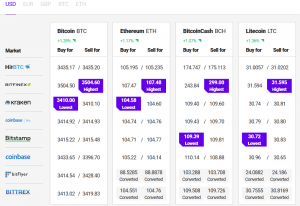 During the past few hours, a few small cap altcoins gained traction and moved up more than 8%, including MGO, IOST, NPXS, BTS and DGB. Out of these, MGO rallied around 17% and IOST is up nearly 11%. To sum up, the current recovery in bitcoin could be short term unless buyers gain momentum. BTC/USD must settle above USD 3,500 to start a decent upward move. If not, the crypto market is likely to resume its slide in the coming sessions.